A true wall clock for the musician?s soul, the Musicians Cuckoo Clock with 8 Day Movement is a super cute piece of your home. Thanks to the chalet design and superior wood finish, the clock can blend well with all types of decor themes. The green paint on the pine trees and windows of this clock make it a very appealing wall accent. Hand-carved and hand-painted, this clock by Romach und Haas features a 36-note musical mechanism. The clock gives out sound of a bird that is produced by real wood whistles. 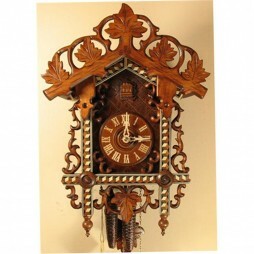 Overall, this is one stunning German clock that can be all yours at an affordable price right away. 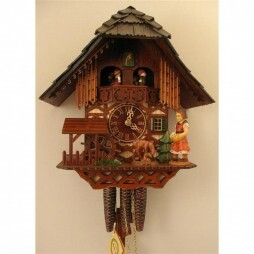 The Angry Hausfrau Cuckoo Clock with 8 Day Movement is a telltale that depicts the every household’s funny story. For the men, this clock may act as a memory of the times when they’ve seen their wives flaring up with anger. Crafted with high-quality wood, this chalet clock features an angry woman figure hitting her husband with a rolling pin. Not just that, he gets hit once at the strike for every hour. Doesn’t that make you laugh already? This is a brilliant animated clock which runs for 8 days on one wind. The large, Swiss music box of this clock gives out the most pleasing tunes. Also, the animated dancers, hands of the clock, the birds and numbers on the dial are crafted from wood. They reflect Germany best watch-making art. Get this stunning teller of time for you home today! The exclusive design which portrays a powerful scene that symbolizes the beauty of nature. Showing a handmade carved eagle coming to the forest while an owl and a hawk calmly perch on the oak branch. Below it, two newborn baby birds seek to fly free from the nest. The detailing done on the clock is a sheer art which is truly incredible. Especially the eagle, its wings beautifully cut offering new dimensions to the clock. The 3-dimesional eagle and carving of leaves are the main highlights of this beautiful piece. Its case holds 35 notes music box and deep-sounding bellows offering the melody to the cuckoo sound. This delicate piece comes wrapped in renewable material to ensure that it reaches you safely. It is a perfect gift for art lovers. 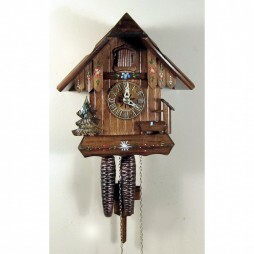 Amplify the elegance of your house with this magnificent Cuckoo Clock 8 Day Movement with Hooting Owls by Romba. This beautifully crafted piece features hand carved wooden owls, grape leaves and maple leaves along with wooden hands and numbers. This walnut colored clock has been made in Germany and can go on for 8 days on one wind. This clock has a special mechanism comprising of two wooden whistles with bellows inside the clock case that reproduce the slow hoot of an owl. The tiny carved leaves around the owl?s door and woodcut hands in the shape of owls enhance the elegance of this mechanical clock. 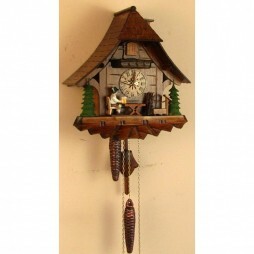 Happy Wanderer Cuckoo Clock with 8 Day Movement is a functional wall accent that will give an amazing look to your home. 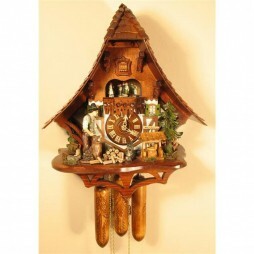 This clock captures the happy story of a traveler who makes his way to a Black Forest Chalet. 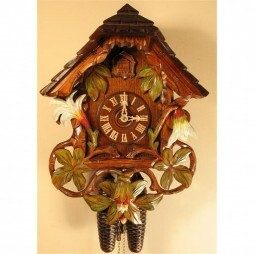 The clock has been intricately designed and has the finest hand-painted figures. The mechanical brass movement of this clock makes it one spectacular teller of time. This VDS-certified clock is an original Black Forest chalet reproduction that has been made in Germany by Romach und Haas. Go ahead and shop for this perfect piece of time today! 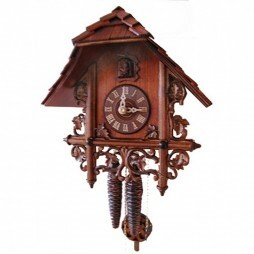 Feeding Birds Chalet Cuckoo Clock by Sternreiter is a very pretty 8-Day movement clock that is made from high-quality wood and has a striking walnut finish. It is basically in the shape of traditional Black Forest chalet with a steep roof with maple leaves and birds carved around its frame. This German masterpiece has a mechanical brass movement that is driven the two pine-shaped weights. 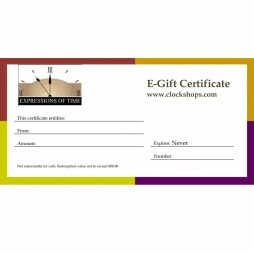 The time escapes this clock with an old-world pendulum tick. It is a spunky and classy telltale that’s perfect for all sorts of decor themes. Feeding Birds Cuckoo Clock is an artistic work of watch-making by Romach und Haas. It features detailed carvings of birds feeding their young ones. It is a beautiful German clock that?ll make your walls come to life in one time. The clock is appreciated for its 8-day movement and a well-polished look. It has a gorgeous wooden dial with gold roman numerals that are pointed at by the chic hands. 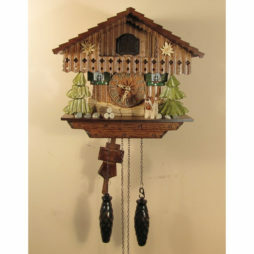 With this carved chalet-style cuckoo clock, you can add a spectacular focal point into your living areas. It is a finely designed German piece that?ll win all hearts in the very first look. 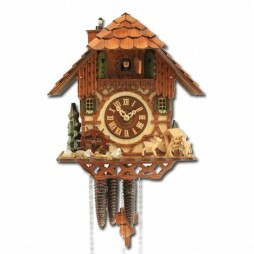 Make the walls of your home an eye-candy by adorning them with this stylish Schone Aussicht Cuckoo Clock. A demonstration of Romach und Haas’ exemplary watch making craft, this clock has a striking design obtained by combining the Rahmenuhr and Bahnhusle together. In the mid 1800s, these clocks where considered to be a symbol of opulence. 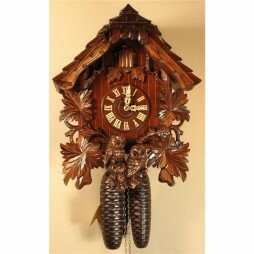 The clock features a hand-painted and elaborately carved Chalet that is wrapped in grapes lines and rustling leaves. 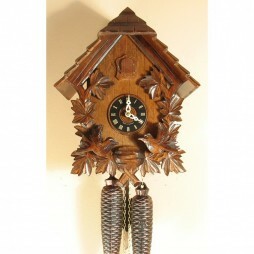 This Black Forest cuckoo clock has a small, enamel dial with brass hands which adds to its elegance. The mechanical brass movement of this clock makes it an exquisite clock that goes well with all decor themes. 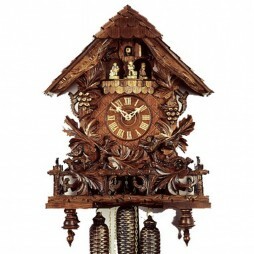 Cuckoo Clock with Farmer Couple and 8 Day Movement is a masterpiece by German watch-maker Romach und Haas. This one has the most exquisite design and intricate details. 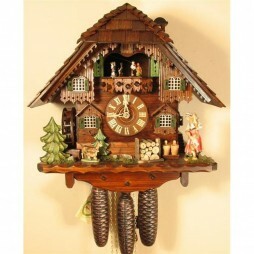 The clock features a couple doing their chores infront of a Black Forest chalet. Other trinkets that are carved from wood are the horse, bell, hens and the well. It is more on a 3-dimensional painting than a clock. Laden with German skills, this clock has the most interesting music box mechanism. 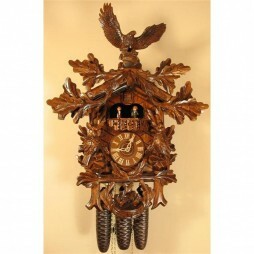 It is a VDS-certified reproduction of an original Black Forest clock. Get this stunning telltale for your home at a super pocket-friendly price today! 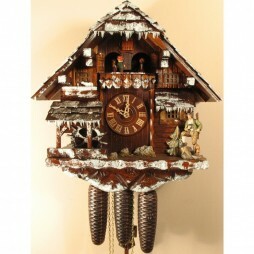 Romach und Haas?s Winter Scene Cuckoo Clock with 8 Day Movement has a gorgeous chalet design. It depicts a beautiful winter scene where a hunter impatiently looks ahead to the hunting season infront of hi snow-covered Black Forest chalet. Every inch of this clock reeks of German brilliance. Crafted from solid wood, this decorative clock comes with a musical box that gives out striking tunes at every cuckoo call. Also, it is has a shut off switch so you can turn off the music during the night. The clock is an eclectic piece of time from Romach und Haas?s exclusive collection and is covered with a 2-year warranty. We all want something unique, something that no one else really has, showcased in our homes. 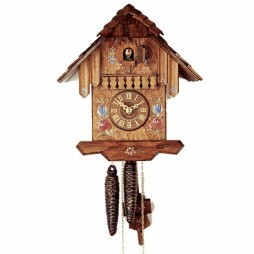 For many, Chalet cuckoo clocks fit that bill. They’re perfect in casual settings like the family room, or make a great statement in the entry foyer or formal dining room. 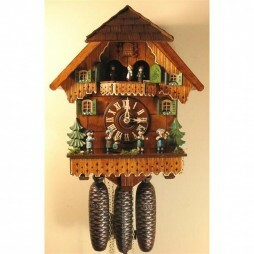 Available in different scenes, cuckoo clocks help you create a story to compliment your space. You might wonder what it is about chalet cuckoo clocks that are so impressionable upon so many. It’s not only the rich history, the refined craft, or the beauty of the final art that draws such a wide array of people to marvel at these. But definitely, curiosity certainly has a part to play. Much like musical chairs, you don’t know what to expect with these historic timepieces. They can be as simple as simple can be, or they can be a wonder to gaze upon. Let’s just start with the engaging history of these fine time keepers. 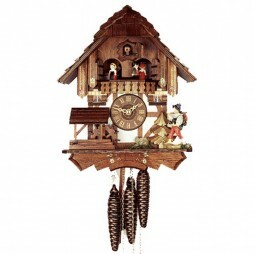 The chalet cuckoo clock happened to be invented around the late 19th century in Switzerland. 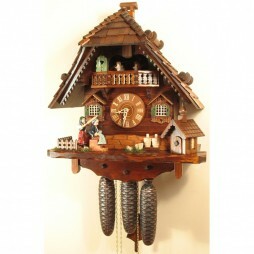 These were made with just as much passion and fine detail as the traditional Bahnhausle cuckoo clocks. Though they don’t have any links to the historic railroad, they do hold distinguishable character within their own right. These pieces resemble finely detailed wooden chalets and can either be designed for mechanical workings or quartz movements. It all has to do with what is preferred and the qualities included within each piece during the crafting process. There is a defining difference between the two of these. The newest variant does happen to be the modern quartz cuckoo clock, though both of these designs are remarkable in all ways. However, the quartz design takes multiple things into consideration, such as what is more convenient in modern times. For example, the quartz design doesn’t follow the traditional mechanisms. The bird call is actually produced electronically, rather than how the traditional cuckoo bird sound is more bellow like. The movement of the quartz design is also different. This clock is regulated by an oscillator and has a fine-tuned frequency too. 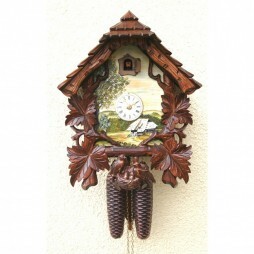 Most chalet cuckoo clocks of today are quite different from those within the historic Black Forest period. Today, they have more features—many of which are advanced. Of course, the traditional cuckoo bird is still present, but there are more model figurines included. Some of these might be woodcutters or even water bearers, depending on the artists’ choice. These changes are often carried out to add more creativity and intrigue. The added features help to express a far more detailed storytelling experience. 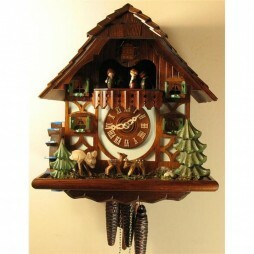 It is very common for many chalet style cuckoo clocks to be representative of the German lifestyle. 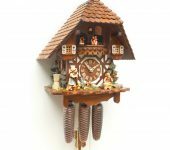 Chalet style cuckoo clocks are also made with movable parts such as: mill wheels, animated figurines and even scenes of vivid colors of water. The carving details that are often engraved on these are extraordinary as well and definitely reminiscent of the German Black Forest region. 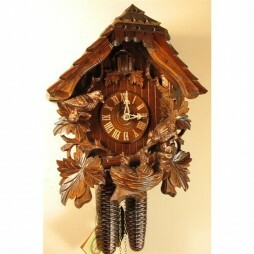 Clock collectors will also find that these are all hand carved and therefore very authentic in every way. There is clearly a lot of attraction for the chalet style cuckoos. 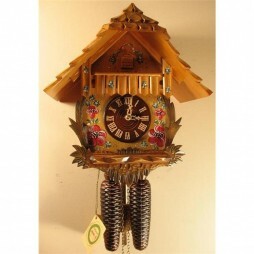 There are three common styles of chalet cuckoo clocks today, and at Expressions of Time we do offer all of these. The 3 popular chalet styles are: Black Forest, Bavarian and the all amazing Swiss. Each is gloriously designed and as always, unique to the artist. The differences between the 3 designs lies in the style of the homes which are carved. For instance, the roof and/or balconies might look just a bit different. There might be more attention to the landscape, or the main idea might be to make it more picturesque. The artist might choose to make the clock more New England in style—keeping it quaint, yet rich with detail. The artist might choose to depict a chalet home or a traditional style manor. 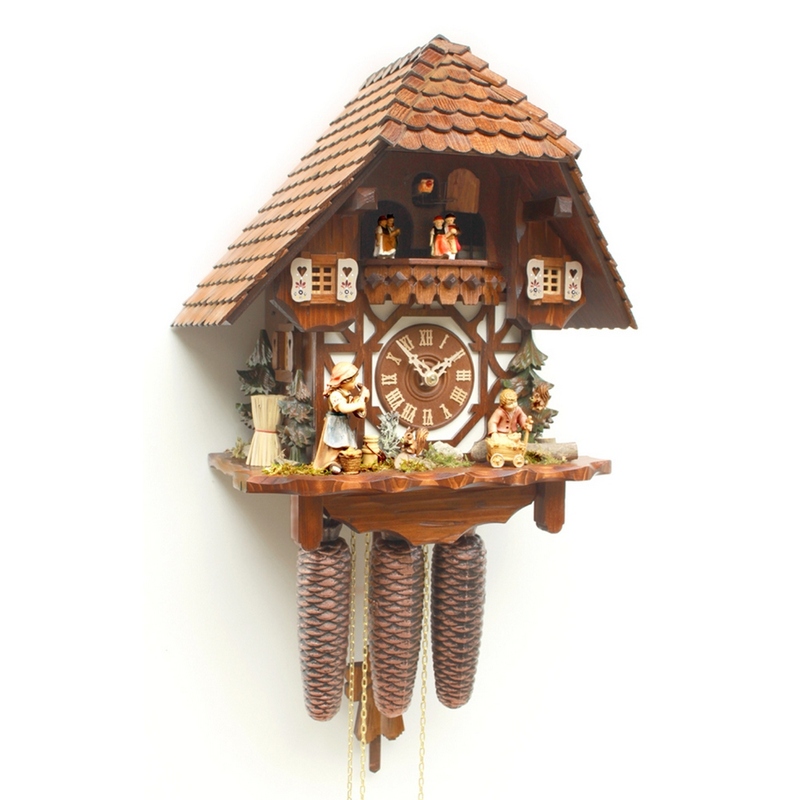 With the Swiss style cuckoo clocks, these actually try and replicate the home styles of Switzerland, so they are an exact replica of life. The Swiss style is so picture perfect it actually makes you feel you are within the portrayed scene. 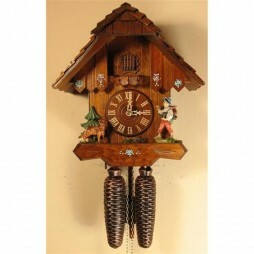 At Expressions of Time you can find a large assortment of chalet cuckoo clocks. None of these are lacking in quality or unique artistry either. 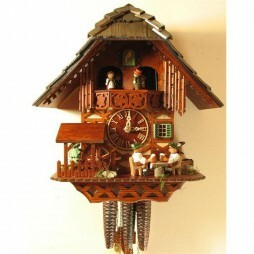 For instance, we are very proud of our Kissing Couple Cuckoo Clock with 1-day movement. The wood carved windows of the clock, and the two figurines add a sense of child-like curiosity to the clock. It certainly holds all of the charm of New England cottage life. Our Bavarian Beer Drinker Cuckoo clock is also very appealing to clock collectors and this piece is certainly an eye catcher. It also follows the traditional Bavarian clock carving too! This time piece has the finest details as well, right down to the very refined shingles on the roof. These are the quality cuckoo clocks you can expect to find when you do shop with Expressions of Time. When shopping with us, if you fail to see a specific model or design you’ve been looking for you can always contact us! 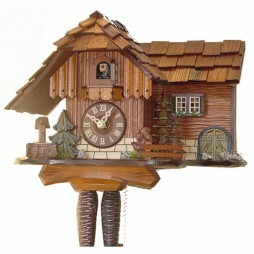 However, we are more than certain you’re going to find the exceptional chalet cuckoo clock you’re looking for. For those clock enthusiasts who like less wood exposed, the chalet style design is the ideal choice. 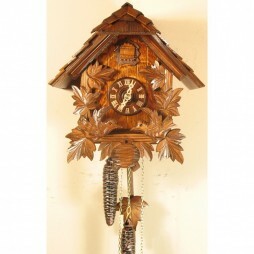 We encourage you to take a peek and find the chalet style clock you’ve been looking for today! 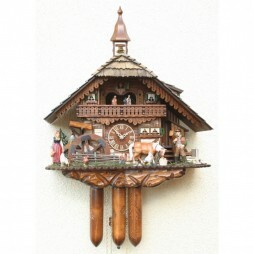 Take the time to browse through all the Chalet cuckoo clocks we offer. One is sure to be perfect for your space. 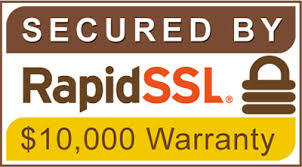 Then, simply click Add to Cart and proceed through our secure checkout or contact us at 866 467-6460 for assistance.